Most days I awake wondering how my food day will go, what will I eat, what will I be willing to forgo in an effort to fight the bulge or at the minimum to maintain the continuous efforts of my legs not getting any bigger. 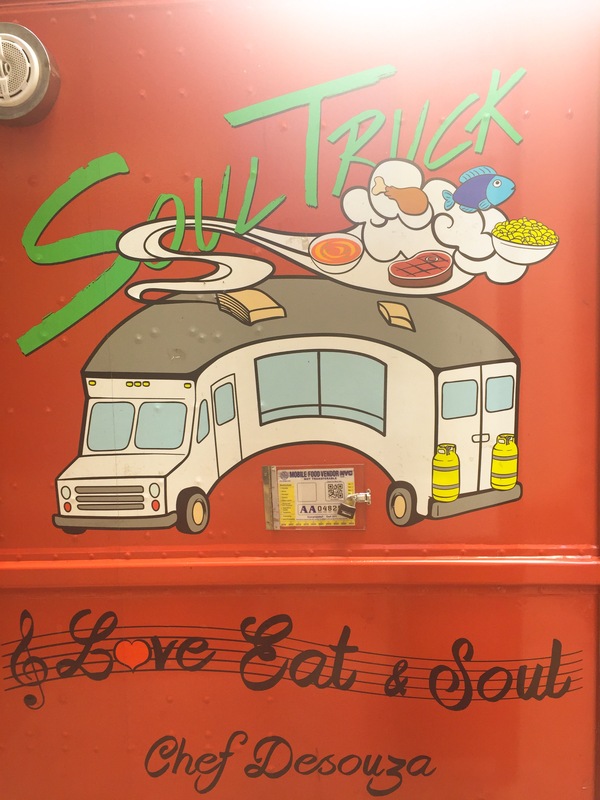 Never seeing this truck before, nor ever hearing of its food, and having a sweet spot for small entrepreneurs I eagerly decided to get a side of collard greens from Soul Truck. Piping hot these collards were given to me which made me believe I was getting the first serving of the day even though it was after 2:00 in the afternoon. Upon opening my take out container, I notice a reason to pause…multiple stems. Stems you say, yes stems, all collard cookers and eaters know for sure that too many stems make your greens bitter. 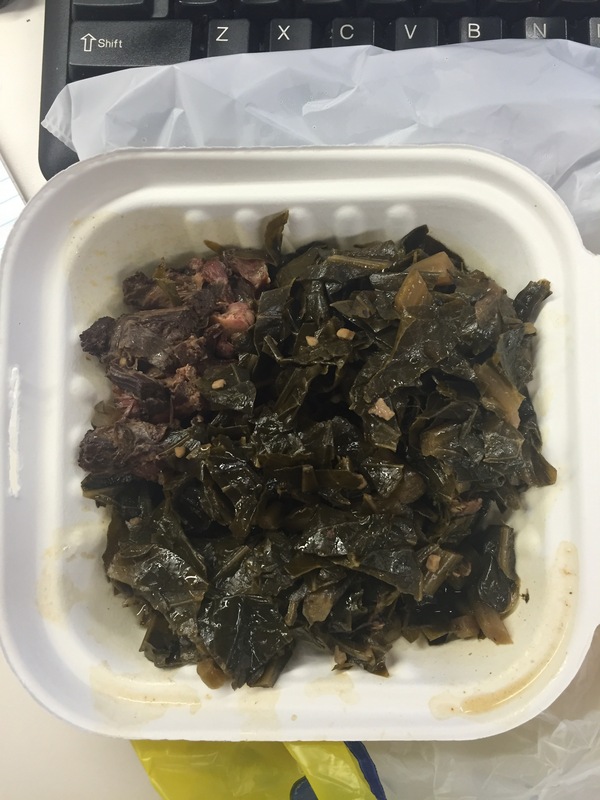 These collards were cooked with turkey instead of pork, yet the turkey was lacking enough flavor to lend some to the collards, it was bordering on the side of being completely unstimulating. Yes the turkey was tender, sure there were nice size bits mixed in the greens, but when meat it tender and flavorless it is synonymous to eating soggy white bread straight from the package. There are times when I eat a dish and somehow upon first bite I get a glimpse of the chef/cook. After eating these collards my first thought was this chef/cook is cooking for the public and not cooking from the belly. Somehow I refuse to believe that if I were eating those greens at the cooks home table they would taste the same. Somehow I am convinced that if I was eating these greens in his home, I would be smacking my jibs, licking my lips, relishing in the fact that I just ate a delicious vegetable without feeling like I ate a vegetable and requesting a second helping. Yes it is true that you want the masses to enjoy your food, yes you want to make food that bypasses people dietary restrictions, but when you cook for the masses and not from your gut, somehow the love is lost, somehow the passion is not integrated, that somewhere it was forgotten that when people eat good food no matter the dietary restrictions it speaks to the soul, and at the end of the day isnt that what soul food is supposed to do? You heard it! Act as if the masses were all dinner guest and do minimize the stems!!! Yes, I totally believe cooking from soul like”Soul Food” the movie. It makes a group of people with busy schedules and health nuts want to cheat when its done right. Let’s get back to our roots. It nothing like a piece of homr to cling too.